I began a new painting this week entitled "The Black Skimmer". 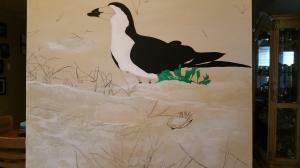 It is inspired by my uncle Charles Jordan's photographs of Black Skimmer birds along the Biloxi, MS gulf coast. The painting is on canvas with acrylics and measure 20X24. I am incorporating a mix of different mediums (e.g., sand, glass beads, and extra heavy gel) to provide texture and depth. In image 3, you can see how I am layering colors onto the glass beads in the seawall. I have blocked in the body of the Egret. However, I will leave the main body section alone for now. I am more interested right now in developing the lower portion of the painting. I will move to different sections of this work only because my interest will change based on my mood and feelings. 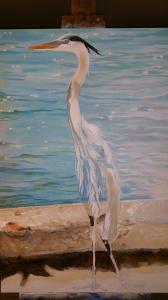 I have begun a new painting in which the subject of the painting is a large Egret. I must thank my uncle Charles Jordan who took the photo of the Egret. He shared it with me, and I instantly fell in love with it. I think what struck me the most was the pose of the Egret. It is an all too familiar swanky stance of an Egret as it moves toward its' prey. So, I think the tile of this painting will be "On the Hunt". 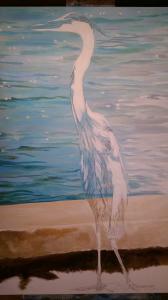 In this photo, I have just begun the process of laying in the foundation colors for the water and Egret. The most difficult part for me to capture is the movement of the water and the reflection of the sun off of it. The size of the canvas is 24X36, and I am using acrylic based paints. I will post different stages as I develop this image and discuss the methods and use of different acrylic mediums. 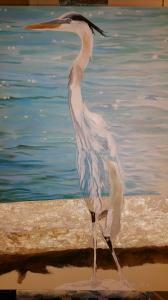 In this image, you will see that I have advanced the stage of applying the foundation colors to the Egret and the seawall. After applying the foundation color for the seawall, I placed a layer of Glass Bead Gel. This will give the seawall the concrete texture. I took the photo with a flash to show the effect and placement of the glass beads. I will covered the majority of the glass beads with color so they will loose the reflective properties in some areas. However, I will comeback later with another layer of Glass Bead Gel to return some reflectivity in areas I want to shine. 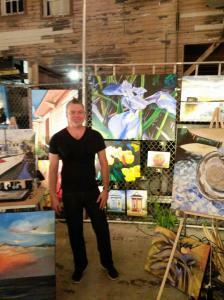 I participated in the Frenchmen Art Market in New Orleans. The atmosphere was exciting and friendly. I enjoyed seeing so many artist and art lovers in one place. The flow of people continued all evening into the early morning hours. I highly recommend this market to everyone. I will be participating again. So, checkout my events page for upcoming dates. I hope to see you there! I would like to thank everyone who participated in the Art After Dark event in downtown Houma. 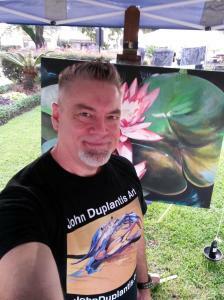 I had a great time meeting and sharing my artwork with art lovers and fellow local artists. I look forward to the next Art After Dark event. 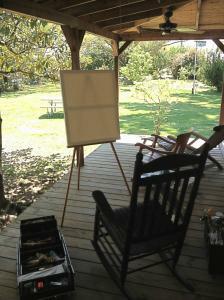 Where is the special place to create new works of art? For me, a office environment with windows overlooking city streets will not work for very long. I believe we all need a change of environment to continue to grow and be inspired. To sit on a porch and feel the cool summer breeze after a refreshing rain is inspiring. As I look from my planned perch, I see countless subjects and designs in nature to be combined into new forms of emotional attachment.